James Mack, former part-time Youth Pastor at Ebenezer UB Church in Greencastle, Pa., resigned that position as of March 1. Chris Moore was hired, as of January 2, as part-time Technology Coordinator at Emmanuel Community UB (Fort Wayne, Ind.). He had previously served as pastor of Good Shepherd UB in Huntington, Ind. Julie Sattison was hired, as of January 13, as part-time Director of Preschool Ministries at Emmanuel Community UB (Fort Wayne, Ind.). 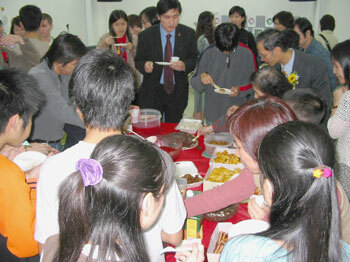 At the 15th anniversary. Sitting in front, l-r, are Jennifer Blandin (fulltime missionary), Byrdena Shuneman (short-term volunteer), Connie Sung (pastor of Living Word church), and Jana Hoobler (Macau Mission Director). 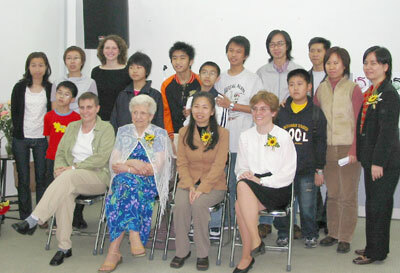 Missionary Linda Neely is standing in back, third from the left. 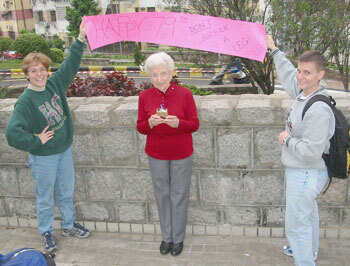 Missionaries Jana Hoobler (left) and Jen Blandin help volunteer missionary Byrdena Shuneman celebrate her 79th birthday. Mike Dennis has been named Interim Pastor of Morocco UB Church, Temperance, Mich.
On Saturday, April 5, 35 children attended an Easter Egg Hunt at Prince Street UB (Shippensburg, Pa.). The children hunted for 600 hidden eggs. The children also viewed a puppet show entitled The Soldier and the Centurion. The Legend of the Easter Egg was read to them, followed by crafts and food. The Wust family will be in the States from June 6 through the end of July, and are available for speaking engagements.